At least five people were killed and 15 wounded when two suicide bombers attacked a church in Pakistan during a service Sunday, just over a week before Christmas, police said. 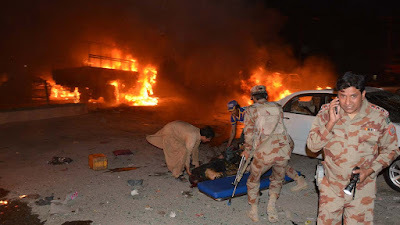 The attack took place at the Methodist Church in the restive southwestern city of Quetta in Balochistan province. Senior city police official Abdul Razzaq Cheema gave the toll, which was confirmed by Balochistan home minister Sarfraz Bugti. Bugti said police intercepted and shot one bomber outside but the second attacker managed to reach the church’s main door where he blew himself up.